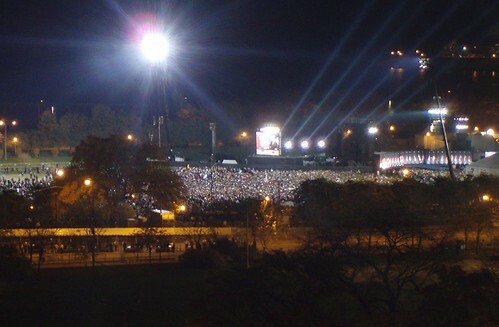 A group of friends got together and rented a couple of rooms in the Michigan Avenue Hilton, overlooking Grant Park, then invited a bunch of folks up to watch the show. Wine flowed freely, and binoculars were passed around as we watched the crowds gather. Yep, that blurry thing? That’s Obama. My full-sized camera and its spectacular zoom lens are currently out of commission, so I did this with a digital point-n-shoot and a pair of binoculars. Aheh. 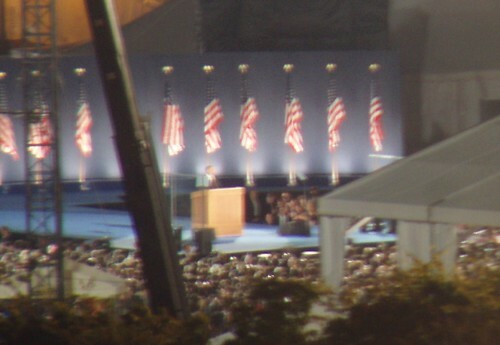 We could hear him making his speech from the park; his words then repeated on a three-second time delay over CNN. 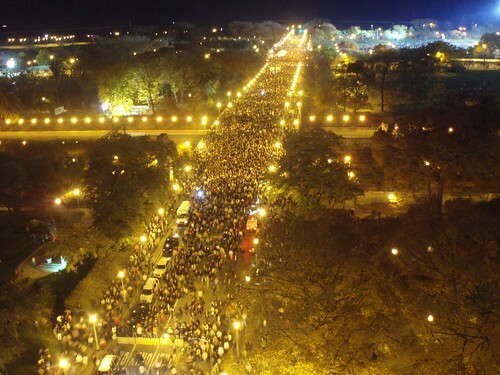 Thousands of people flooded down Balbo and back into downtown after the rally was over. All around, the air was electric. Despite the crowds, we saw no sign of problems or trouble… just a lot of happy, happy people. Great photos, especially considering the camera+binoculars setup. Where did you take the overhead perspective shots from? I can never make pictures at night look like that. You are an amazing photographer, Robert! You and your readers might enjoy this:My Chicago Election Day DiaryBeautiful pics. You and your readers are pretty advanced. I am still looking to master the camera phone. Man that would of been on e great night to be in Chicago! 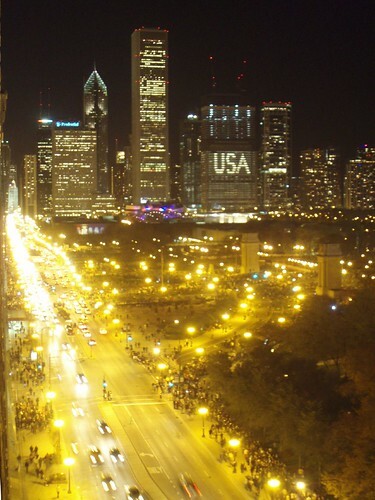 Chicago really was the place to be on that night, what a party!